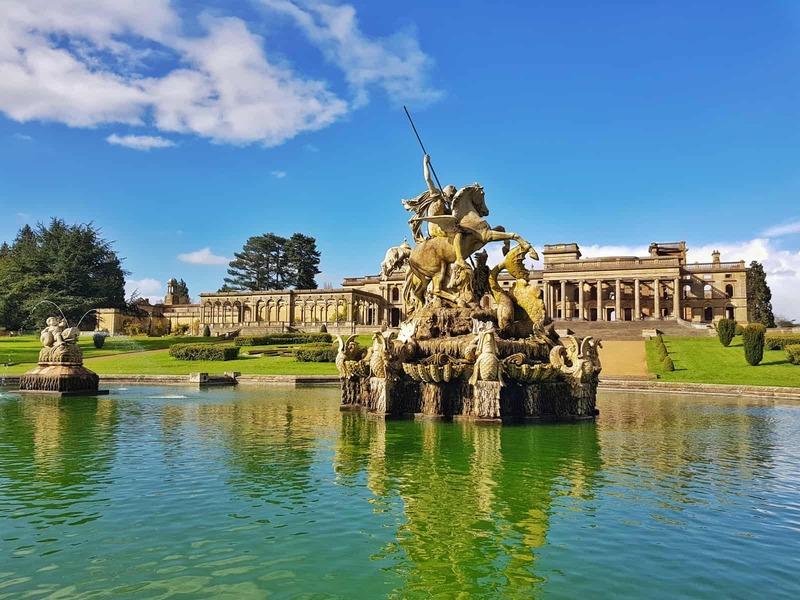 We only discovered Witley Court a few weeks ago despite living nearby. 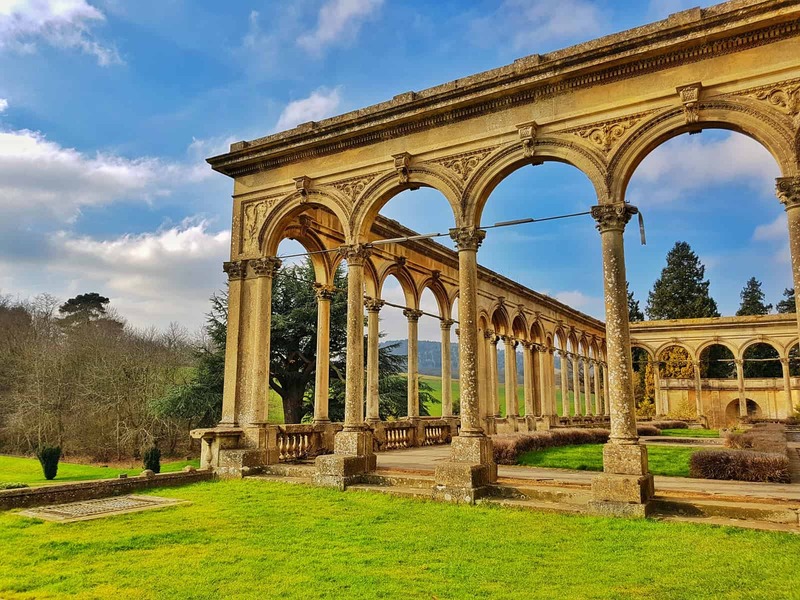 It’s an English Heritage property with woodland walks, formal gardens and a fascinated stately home that is completely in ruins. Not only is it the perfect destination for a family day out, but it’s dog friendly too. Here are 9 things you need to know about it. 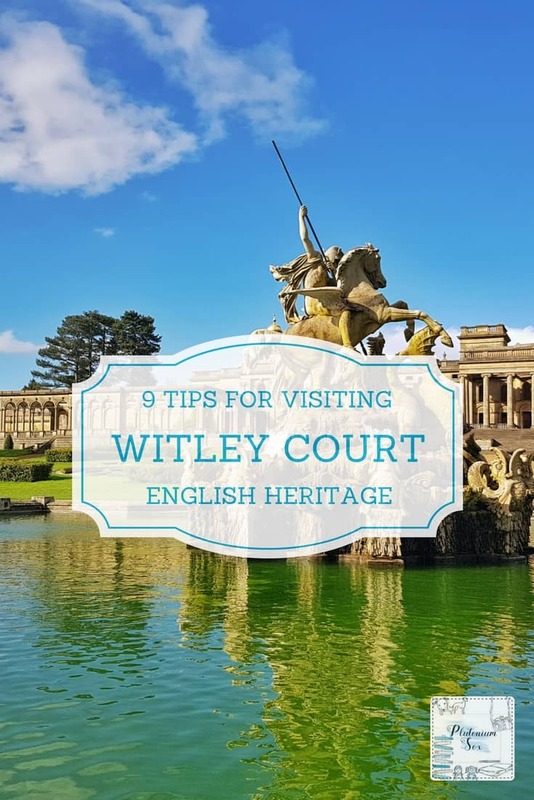 Witley Court is an English Heritage property, so don’t forget to bring your card with you if you’re a member. 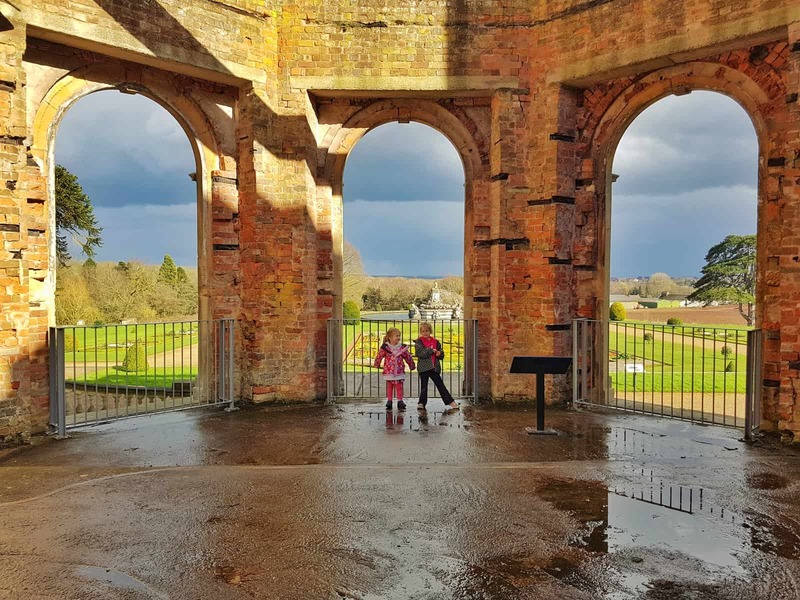 Entry to Witley Court costs £22.40 for a family, whereas family membership to English Heritage is only £8.25 a month if you join for a year. So, if you regularly visit this or other properties it is well worth looking into a membership. 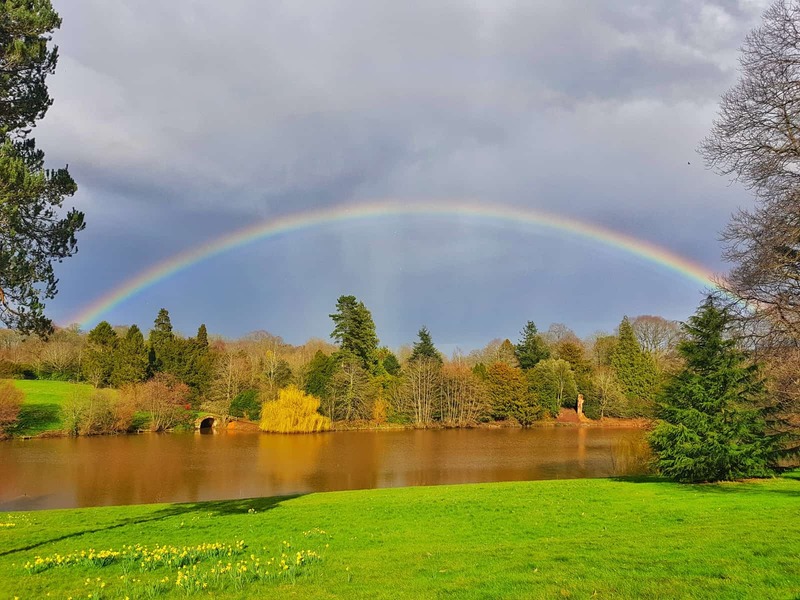 During the summer months, Witley Court is open from 10 am to 6 pm every day. We have been once on a glorious sunny day and once in sunshine and showers. Each has been somewhat muddy, as is to be expected at this time of year. But the rain honestly didn’t bother us. When you first arrive, you head straight into the park and woodland area. There are several playgrounds around and it’s about a 15 minute (with children) walk to the house, church and cafe. We did get caught in the rain but managed to take shelter under some trees and we were soon dry and warm in the cafe. So, I would probably recommend visiting whatever the weather as long as you have the right clothing – and wellies! The woodland trails and lakeside area are idyllic. The girls happily amused themselves at the three playground areas near to the entrance. However, when it came to walking over to the house, they did get a bit restless. Taking their bikes definitely made it easier for us to enjoy the walk without having to entertain them. 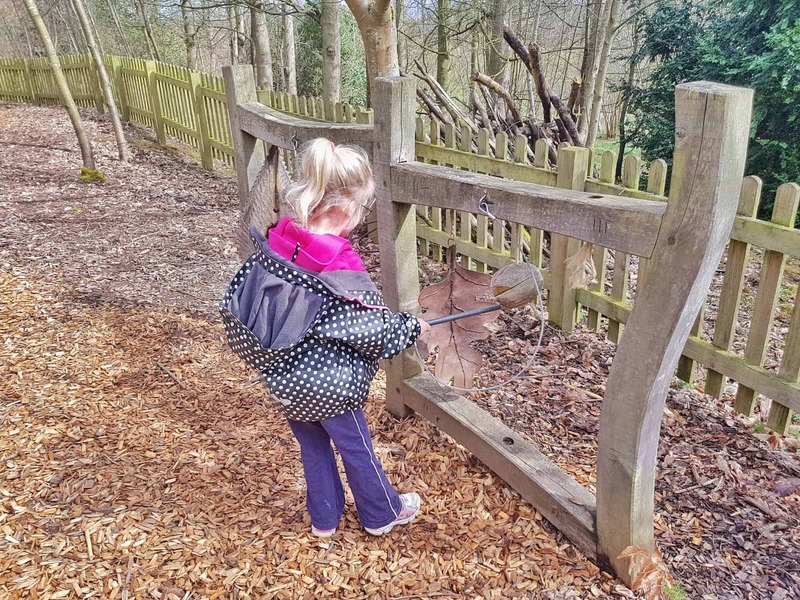 The paths are a bit up and down so do keep an eye on children who struggle to use their brakes. Bikes need to be left at the entrance to the house itself because they are not allowed in the ruin or the formal gardens. Not only were dogs welcome in the outdoor areas, they were fine to visit the ruins and even the cafe. The only time they had to wait outside was while we looked around the church. The first time we visited, we didn’t make it into the church. That was part of the reason we went back, I’d heard such great things about it. It’s not part of Witley Court, but is well worth visiting in its own right. 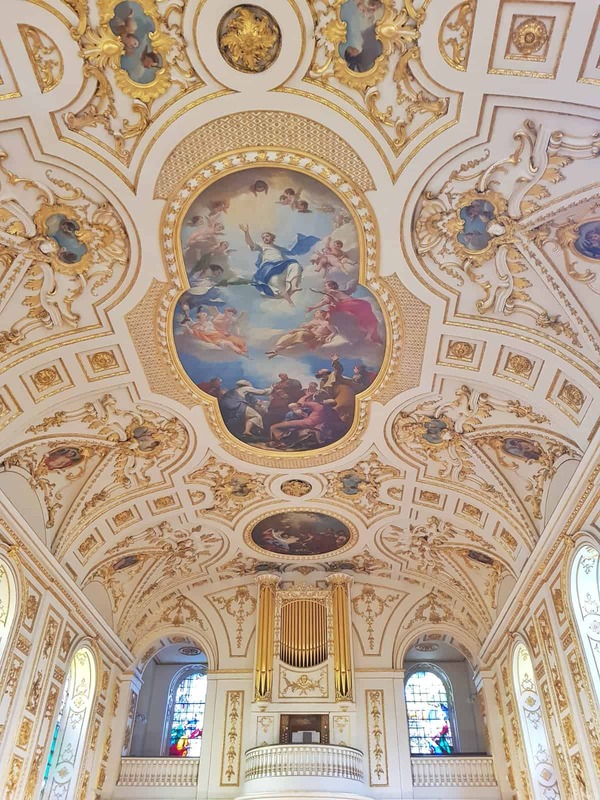 The ceiling is incredibly ornate, covered in paintings and the organ is widely accepted to be one of the best in Worcestershire. They are really family friendly and hand out sheets for children to tick the parts of the church they have spotted. When you arrive at the ruin itself, there is a separate gate. You have to show your receipt for entry and can collect a free audio guide. I have to admit I’ve never listened to the audio guide, my girls are a bit young for it and I preferred to keep my hands free to walk around the ruin with them. I do look forward to hearing it in the future though, it’s a fascinating place. 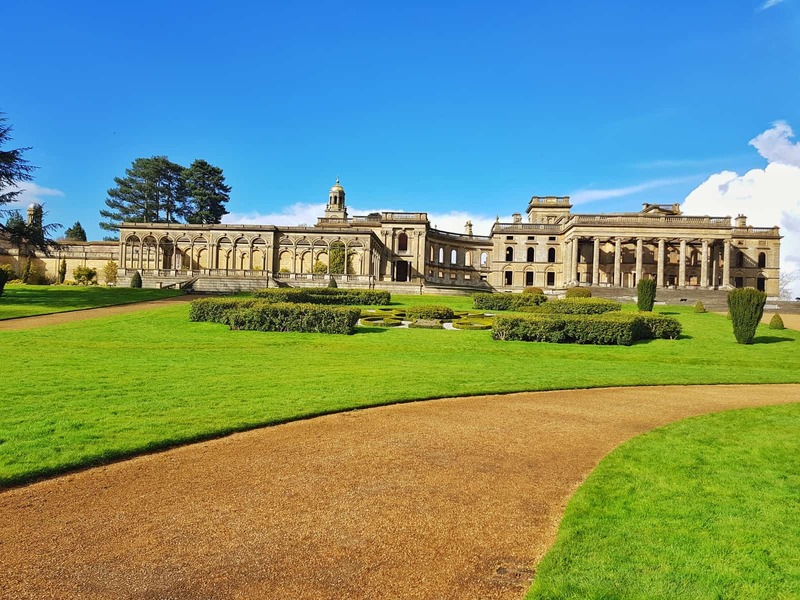 If you’ve never been to Witley Court, don’t go with hopes of looking around a perfectly restored house. It is in fact a mere shell of a building with no ceilings, wall coverings or floors. 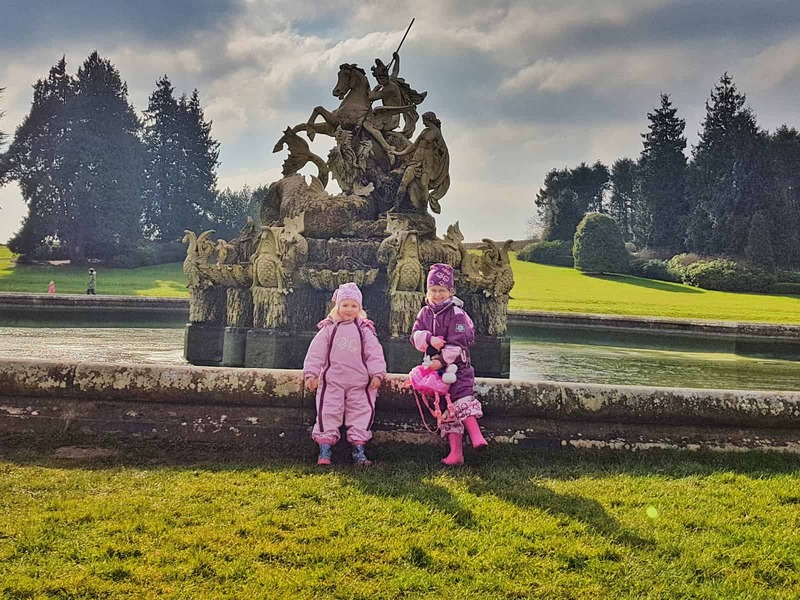 You can explore the ground floor and the beautiful formal gardens, where fountains spring to life every hour. It is a relaxing, peaceful place but also rather sad. I can only imagine what it would be like today if it hadn’t been devastated by fire. Near to the church and ruin, there is an adorable little tearoom. A large, warm conservatory area is full of beautiful plants making it the perfect place to relax over lunch with the family and dogs. They serve basic but tasty meals including soup, panini and salads. The children’s menu has a similar but smaller offering. The cakes are also rather tasty, I felt I ought to check. 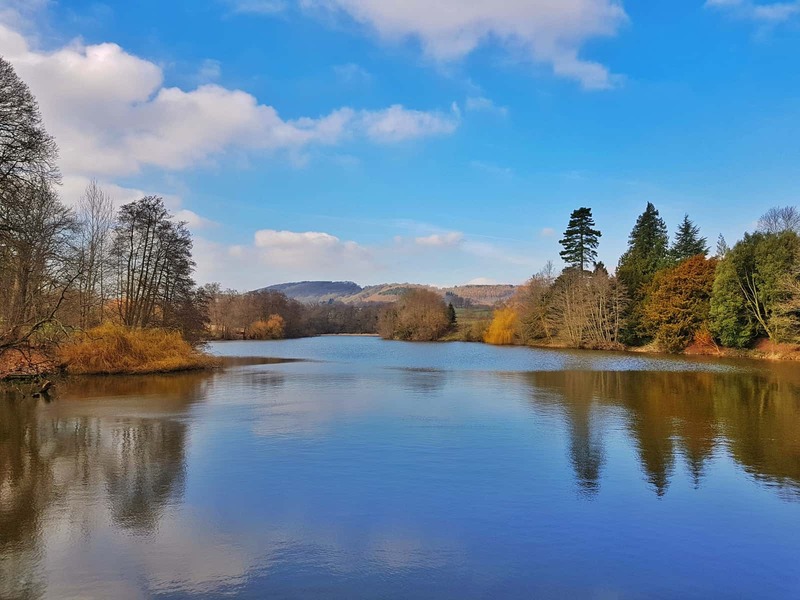 The tearoom isn’t part of Witley Court itself, and there are plenty of places around the woodland and formal gardens that would be perfect for a picnic. This will be something we’ll do in the future as now we have English Heritage membership, it will make it a completely free day out. You can also buy hot drinks and snacks from the visitor centre at the entrance. I am by all accounts a terrible mother (my children can vouch for this), so I always rush the girls through the gift shop reinforcing the fact that they are absolutely not buying anything. However, when we arrived last week there were some tasting samples of jams and preserves by the counter. These were delicious and I’m now almost as keen as the girls to buy a souvenir next time we visit. 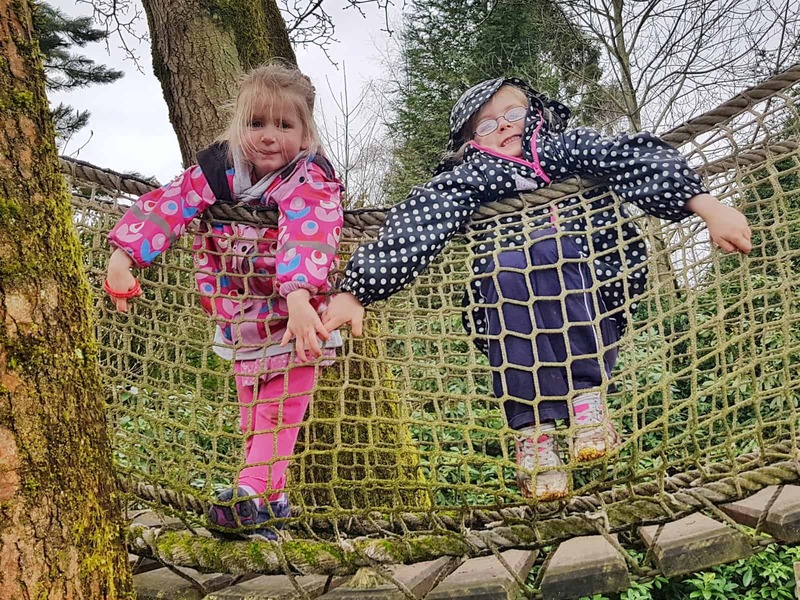 For more ideas of local attractions, head to my list of 58 family friendly days out in the West Midlands. It looks amazing! The ruins are HUGE! Definitely seems worthwhile to get membership if you have great properties like this to visit. Ahh it is such a fab place! And yep, so pleased we have membership now. Oh they really would, it’s a fabulous place.